Hola. This article is intended for people that are not in the space industry and that have a bit of curiosity about its business potential. OK let’s get started. Point A is your probable perception of space (grey words above). Point B is where space is currently situated … a place where entrepreneurs can now think of space applications and bring them to reality. But first, a bit of history. Everything has a background… keep reading. 1955 — The space race between the United States and the USSR begins. 1957 — First satellite is launched by the USSR (Sputnik 1), replica below. 1958 — NASA is born. 1961 — Yuri Gagarin (USSR) makes the first orbital flight with Vostok 1. 1966 — Luna 9 (USSR) makes the first soft landing on the Moon. 1969 — US lands the first man on the Moon (Neil Armstrong, first to walk on it). 1972 — Last man to touch the surface of the Moon (Gene Cernan). 1981 — First Space Shuttle flight. For 20 years, the Shuttle was the taxi for US astronauts to space. Two main byproducts that came from it are the Hubble Space Telescope and the International Space Station (ISS). 2002- SpaceX is founded. This is where the fun begins, wake up! 2003 — First cubesats (10 cubic centimeter satellites) launched into orbit. 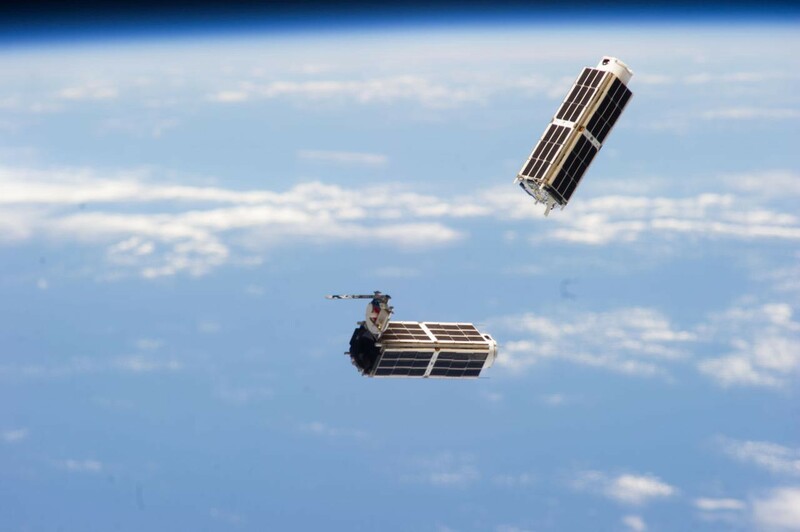 The image below is actually a cubesat, look how small it is! 2004 — SpaceShipOne wins XPrize achieving the first manned private spaceflight. Burt Rutan and Paul Allen (Microsoft co-founder) were involved in the project. Richard Branson then licensed their technology and branded it: Virgin Galactic. 2010 — Planet, an Earth observation company, was founded. Today it has several shoe box sized satellites that provide valuable data for different verticals like energy & infrastructure, finance, defense, insurance & agriculture. 2011 — NASA decides to scrap the Space Shuttle. The decision to cancel it was a result of high costs, a couple of accidents and performance. The Shuttle left a void that had to be covered by entrepreneurs. Enter NewSpace (those decentralized companies that were born from this or were founded before and received a push from this environment). 2012 — SpaceX launches Dragon and docks it with the International Space Station (ISS). It was the first commercial spacecraft to achieve this. Something only done before by space agencies. 2015 — SpaceX (Musk) lands the first ever rocket during an orbital launch. Blue Origin (Bezos) had landed New Shepard booster while making a suborbital flight a month before. Suborbital goes up and down, orbital goes around the Earth. Why is this important? : rocket reusability contributes to lower launch costs. When the Shuttle was winding down, NASA and the new class of space companies had to solve for space access. NASA challenged these companies to develop new space markets while solving the access to the ISS (International Space Station). This was done with a public private partnership where NASA would be the customer, not the supervisor. Previously, private enterprise that worked with NASA did it on a cost plus contract basis. This allowed them to be largely insured against potential risk of their investments but were largely limited of the potential profits. Nowadays, companies absorb significant amount of risk which is commensurate to the big returns they can achieve. (Source: Space, the Final Economic Frontier, Matthew Weinzierl). This changed everything. NewSpace would now refer not only to a new generation of space companies but a new approach to do business in the industry. So, fast forward to the last three years we have seen a plethora of startups creating earth observation, data analysis, space data storage, communications and space infrastructure business models. Apart from all I have detailed, the two main reasons for this to happen are: lower launch costs and miniaturization of components. An entrepreneur thinking of a space to earth application certainly has more stimulus to test the waters! That’s it, the app store is now open for business! 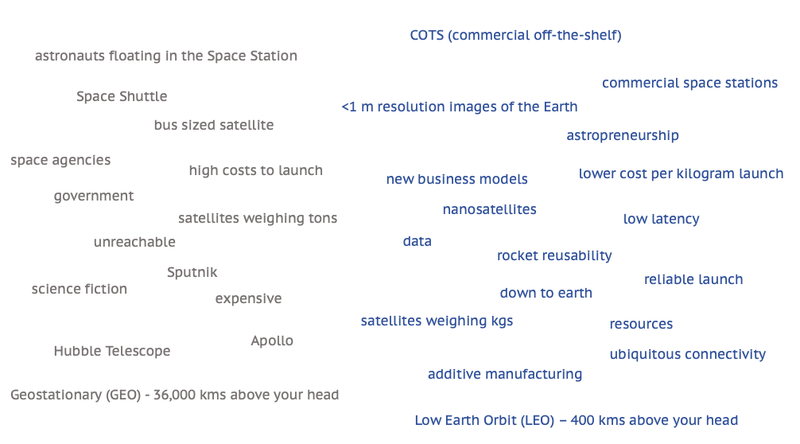 Space to Earth: services delivered from space assets for use on Earth. For me those are: earth observation, communications, data analysis, space additive manufacturing, microgravity experimentation platforms. Earth to Space: infrastructure and services provided on Earth to facilitate the use & exploitation of space (launch vehicles, ground stations, satellite terminals and equipment). Space to Space: services delivered in space (satellite servicing, data relay systems, fuel depots, space manufacturing, commercial space stations). OK. So now you know: a bit of space history; how did we transition from “old space” to Newspace; and finally I want you to see the chart below. It is a summary with some amazing applications related to this industry. Take your time to read and absorb it. You might even think of a business idea around it. 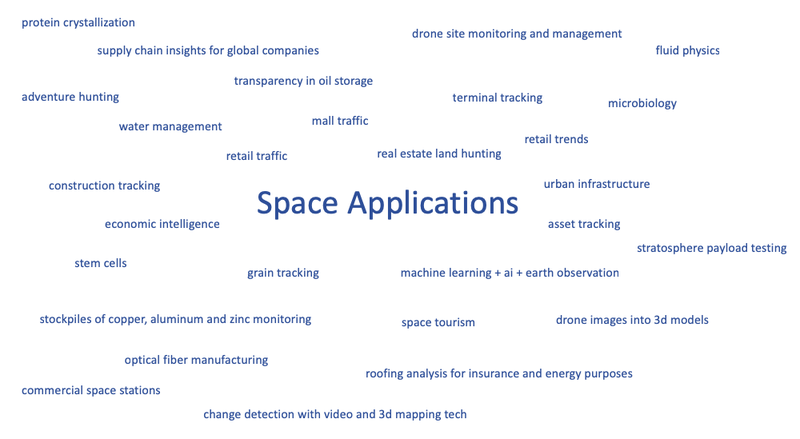 As you can see most of these applications are down to earth, meaning we haven’t got to the point where we have fuel depots in space, efficient debris removal or recurrent space tourism to the Moon. However, these apps are the basis for more exciting stuff in the mid to long term future. My hope is that you are now in Point B and that I inspired you to think about Point C which is a future where Mars, the Moon and the asteroid ring come to our reach. A journey of self discovery. Bridging the gap between space and business.